The all-new A8 sedan arrived in grand style, with the high-tech luxury limo making its world debut at the Audi Summit in Barcelona, Spain on Tuesday. The new A8, which will hit the market next year, marks the debut of the German automaker’s latest autonomous driving and mild-hybrid technology. 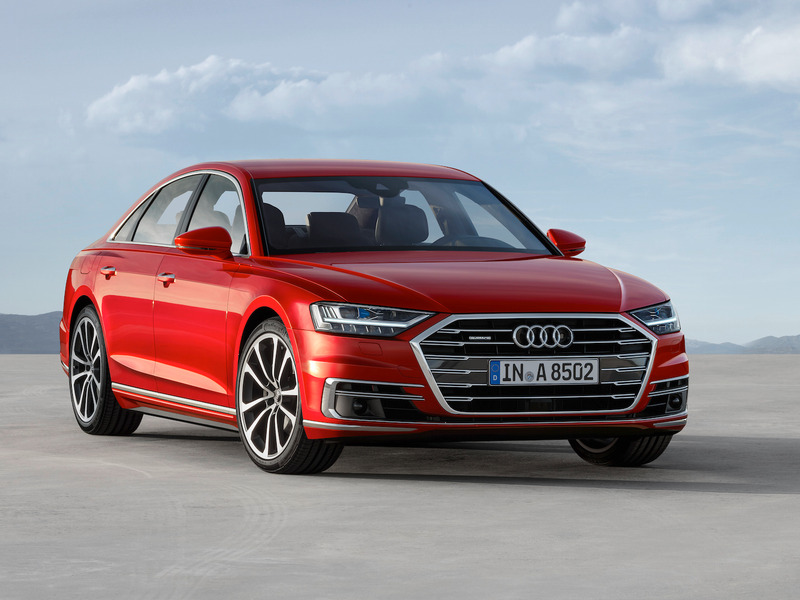 The fourth generation of the brand’s flagship sedan is the latest in a slew of new Audi models to appear over the past year including the new A4, A5, and Q5. Even though Audi gave the world a sneak peek of the new A8 last month at the premiere of “Spider-man: Homecoming”, this the first time we’ve had a clean look at the sedan’s new sheet metal. The overall look of the A8 is stylish yet restrained and falls in line with the aesthetics of the new generation A4 and A5 models that are already on sale. Under the hood, Audi will offer buyers a slew of options including three gasoline, two diesel, and one plug-in hybrid power unit. Although, it is unlikely the diesel engines will make it to the US. The gasoline options include a 340 horsepower, 3.0 litre turbocharged V6; a 460 hp, 4.0 litre turbo V8; and a 585 hp, 6.0 W12 — all will feature new mild-hybrid technology that will allow the car to coast with the engine shut off. The long wheel-base A8 L e-tron quattro plug-in hybrid will get a 449 system hp, hybrid drive unit featuring a 3.0 litre gasoline V6 and an electric drive system. In total, the system boasts more than 31 miles of pure electric range. 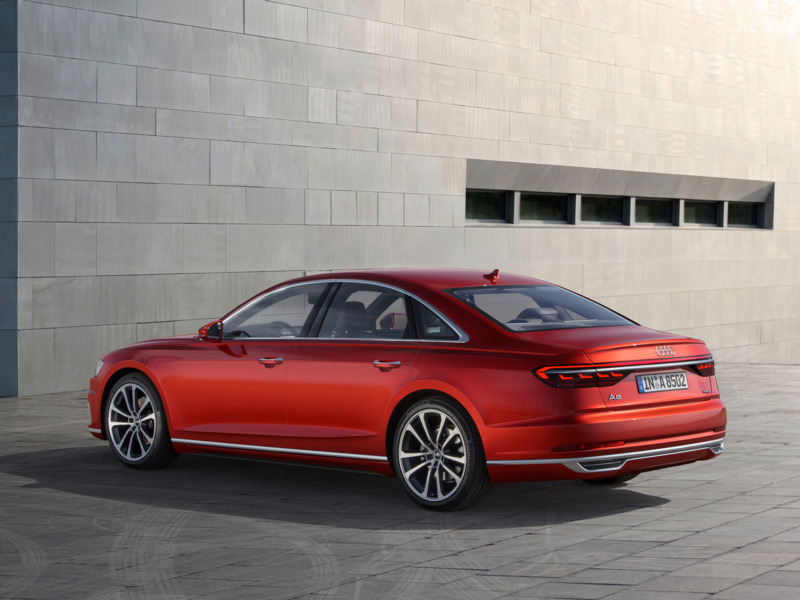 In addition, all A8s will feature an eight-speed Tiptronic automatic transmission, quattro permanent all-wheel-drive, and available rear wheel steering. Inside the elegant cabin, occupants are treated to a high tech luxury lounge experience. The A8 will feature the latest version of Audi’s MMI infotainment system with in-car 4G LTE connectivity. Dominating the center stack are a pair of large touch sensitive control screens. In fact, the entire center console is stylishly devoid of buttons. At the same time, the driver will have the benefit of Audi’s latest AI autonomous driving technology. The new A8 is expected to have Level 3 autonomous through its traffic jam pilot system. According to Audi, the system will take complete control of the A8 on divided highways when travelling at speeds less than 37.3 mph. The system works using a series of cameras, ultrasonic sensors, and a front-mounted radar. In addition, the A8 is capable of driverless parking. In total, Audi says the A8 is equipped with no fewer than 41 driver’s assistance features. The new Audi A8 is expected to arrive in US showrooms next year as a 2019 model. Official pricing for the new A8 is not yet available.